A couple of my good friends from high school have been investing so much time, effort, money, blood, sweat and tears into this brilliant invention. I wouldn't blog about it if I didn't believe in it and if I didn't think it would be something that could make things easier for a lot of people. I can totally see big businesses using this, too- instead of those supposedly easy to remember numeric combinations that, i for one, still can't manage to memorize since I don't order food (or any other thing) for delivery on a regular basis. I was fortunate enough to have witnessed the development of this. I remember Albert (the brains!) and Steven (also brainy, my other good friend from HS. LOL) giving me a run-through of the concept and plans sometime last year. They asked about my thoughts on patenting, privacy issues (I think I have enough stories about my accounts getting hacked) and other things a person like me (techy and highly dependent on the interwebz and my gadgets) would think about this new app. I quickly called dibs and registered the names I wanted, and did that again when they revamped their site and officially went to register/process SpellDial. Imagine just having to type CHUCKS, TOPSHOP, RISTRAS, KFC, MCDO, JOLLIBEE, JUSTINBIEBER, ANNEHATHAWAY, etc. to reach different establishments/people!!! If you have a growing business, this will be super useful in getting clients/customers to remember how to reach you! No more country codes, no more "interesting" number combinations! We've been used to contacting each other through phone numbers for years. We frequently ask people we meet, "What's your number?". However, unless we save it in our phonebook, we barely remember their numbers. That's because our brains are not used to memorizing numbers, but we're pretty good with remembering names! That's why SpellDial was made. 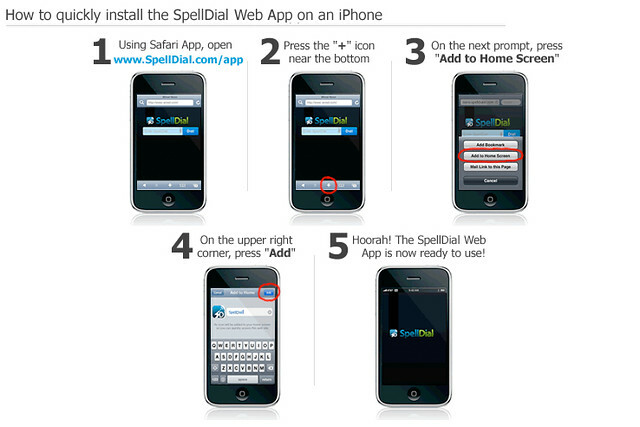 SpellDial is a technology that allows you to call a person through a name, rather than a number. So you can actually say to your friends, "Call me at joninahottie! That's my spelldial." And that's way easier to remember. Think that's cool? Get your own spelldial name. There's free and paid versions. SO GET THE NAME YOU WANT BEFORE SOMEONE ELSE TAKES IT!!! So why is it only a web app? Well sadly, iPhone/android/BB apps take YEARS to develop and register, so for now we can all enjoy this through a web app! At least it's FREE and super easy to install!